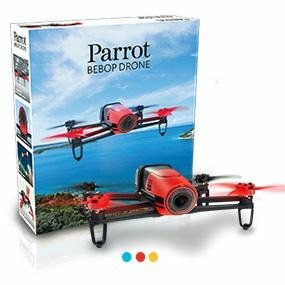 Parrot Bebop is becoming popular in the world of drones and quadcopters. The quality, performance, and good-looking design of their models are attracting users from all over the world. Here we present some of the latest Parrot Bebop quadcopters and drones models. To ensure optimal stability without compromising the maneuverability, the Bebop Drone automatically analyzes data from numerous 3-axis sensors: accelerometer, gyroscope, magnetometer. One ultrasound sensor with an 8 meters reach, one pressure sensor and one vertical camera to measure speed. Equipped with a 14 megapixel ‘fisheye’ camera, the Parrot Bebop Drone records videos and takes pictures within a 180° field of view with remarkable image quality. Full-digital image stabilization technology allows the Bebop Drone to take remarkably stable and clear aerial footage regardless of the drones movements, as well as providing a splash and dust proof lens. Action cameras often show distorted horizontal lines. The Parrot Bebop Drone camera provides undistorted lines resulting in a perfect, uncurved horizon. The user-friendly application was developed for usability allowing the pilot to be entirely focused on the pleasure of flying. From the home page of the app the pilot can access basic functionalities: Piloting, photos/videos, flight plan, Cloud ‘Pilot Academy’. ..
‘Freeflight 3’ offers users complete control of their altitude and speed settings and piloting mode (accelerometer, virtual joystick…). It also includes fun features such as one-touch Flip! The Parrot Bebop Drone photo and video stream is synchronized in real time with your smartphone: Instantly share your best photos on Facebook or Instagram and showcase your flights on Youtube with the touch of a finger. Parrot BEBOP Freeflight 3: An ultra intuitive application. Bebop 2 now includes the new Parrot Skycontroller 2 and Parrot Cockpitglasses for ultra-precise piloting and immersive flight! Experience flight like never before using this customizable extended-range controller and FPV headset. You can now explore previously inaccessible places like never before, and capture incredible pictures and videos. Climb onboard with Parrot Cockpitglasses, an immersive FPV headset. Simply connect to the FreeFlight Pro application on your smart phone and place it into the Cockpitglasses. Parrot Bebop 2’s Full HD 1080p camera offers stunning footage, and it will feel as if you are flying. The rest of the world no longer exists! The Cockpitglasses are also extremely comfortable to wear, even for pilots who wear normal glasses. With the Parrot Skycontroller 2, use two joysticks for ultra-precise piloting and fly your Bebop 2 up to 1.2 miles away! Take off and land with the touch of a single button. Leave on an adventure and know you’ll always get home safely with the Return Home feature. Play with altitudes, direction and speed knowing stability is guaranteed with the anti-stall system. You are fully in command of all your adventures! Parrot Bebop 2 is designed to fly both inside and outside. It is the first leisure drone weighing less than 500g with up to 25 minutes of battery life. The Full HD 1080p camera records stunning video footage in flight. The 3-axis digital stabilization system ensures that footage is smooth and clear, no matter how the drone moves in flight. The Bebop 2 is also compact and easy to transport, meaning you’ll never miss a chance to capture great videos and photos! FreeFlight Pro is a dedicated app for piloting Parrot Bebop, Bebop 2 and Disco drones. The interface was designed for use with FPV glasses and allows you to enjoy total immersion. All your routes, photos, films and data are saved on the app. You can find them easily and share your impressive adventures with friends and family. With FreeFlight Pro, you can also access Flight Plan, an in-app purchase that helps you create autonomous flight plans (altitude, speed, camera angle, etc.). Simply map out your flight using waypoints, hit takeoff, and watch your drone do the rest! Bebop 2 is easy to fly using the FreeFlight 3 piloting app on your smart phone or tablet, which is available for free download in the Apple App Store and Google Play. Once downloaded, you can take off and land with the touch of a button, and practice your flips and tricks mid-flight. Stream footage from your Bebop 2 in real time on your smart phone or tablet. Feel like changing up your view? Adjust the camera’s angle with the single swipe of your finger. 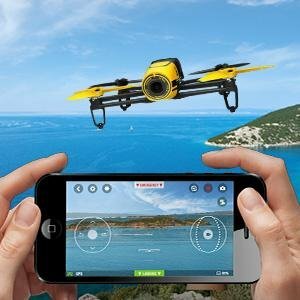 This entry was posted in Quadcopter and tagged bebop, bebop drone, Bebop Parot Drone Quadcopters, drone bebop, parot bebop, quadcopter bebop by qcopterpilot. Bookmark the permalink.